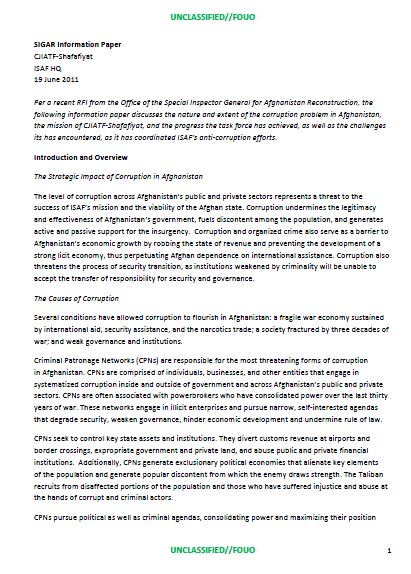 Per a recent RFI from the Office of the Special Inspector General for Afghanistan Reconstruction, the following information paper discusses the nature and extent of the corruption problem in Afghanistan, the mission of CJIATF-Shafafiyat, and the progress the task force has achieved, as well as the challenges its has encountered, as it has coordinated ISAF’s anti-corruption efforts. The level of corruption across Afghanistan’s public and private sectors represents a threat to the success of ISAF’s mission and the viability of the Afghan state. Corruption undermines the legitimacy and effectiveness of Afghanistan’s government, fuels discontent among the population, and generates active and passive support for the insurgency. Corruption and organized crime also serve as a barrier to Afghanistan’s economic growth by robbing the state of revenue and preventing the development of a strong licit economy, thus perpetuating Afghan dependence on international assistance. Corruption also threatens the process of security transition, as institutions weakened by criminality will be unable to accept the transfer of responsibility for security and governance. Several conditions have allowed corruption to flourish in Afghanistan: a fragile war economy sustained by international aid, security assistance, and the narcotics trade; a society fractured by three decades of war; and weak governance and institutions. Criminal Patronage Networks (CPNs) are responsible for the most threatening forms of corruption in Afghanistan. CPNs are comprised of individuals, businesses, and other entities that engage in systematized corruption inside and outside of government and across Afghanistan’s public and private sectors. CPNs are often associated with powerbrokers who have consolidated power over the last thirty years of war. These networks engage in illicit enterprises and pursue narrow, self-interested agendas that degrade security, weaken governance, hinder economic development and undermine rule of law. CPNs seek to control key state assets and institutions. They divert customs revenue at airports and border crossings, expropriate government and private land, and abuse public and private financial institutions. Additionally, CPNs generate exclusionary political economies that alienate key elements of the population and generate popular discontent from which the enemy draws strength. The Taliban recruits from disaffected portions of the population and those who have suffered injustice and abuse at the hands of corrupt and criminal actors. CPNs pursue political as well as criminal agendas, consolidating power and maximizing their position relative to other networks. It is for this reason that efforts to reduce corruption must be grounded in an understanding of Afghan politics, and combined with efforts to convince Afghan leaders that it is in their interest to reduce the threat of corruption and organized crime.